You have put in service practices that claim to guarantee great customer engagement. But, surprisingly, the customer satisfaction numbers are in steady decline. You are scratching your head to find out why! Customer engagement practices are great, but..
What about engagement with your customer service executive? In a global management survey conducted in 2014, 40% customer service executives said they were not adequately appreciated for their efforts. A whopping 77% of them suggested that they would work harder if they were rewarded and motivated more. A green horn customer service executive can find his first days on the job daunting. He has to prove his worth to the new organization and impress his colleagues, supervisors etc. Many organizations just thrust new recruits to the job, without any proper training and hope for the best. Not an ideal situation for motivation. What you can do is create a great initial training phase by applying CRM gamification principles. For proper on-boarding experience, you can create a social collaboration platform where seniors can guide the newbies and increase cohesiveness. New inductees will not feel isolated or left out. You can even include real time analytic that can guide you towards best practices for learning acceleration and reducing unnecessary complexities. Your CSE (Customer Service Executive) has a personal life. Leading management experts say that in order to have a motivated workforce, it is essential for them to have work life balance. Today CRM developers are focusing on creating workforce management capabilities like viewing shift details, exchanging time slots, planning vacations etc. You can use your CRM software to see which executive is over-worked or under-worked and accordingly distribute the workload. Make your workforce career path completely visible to your CSEs. He should know where he will stand in terms of designation and skill for the future. You can integrate training and career progression metrics. Such transparency is a great motivator for customer service executives. CSEs tend to get bored and depressed with repetitive tasks that adds no value to their skill set. You can apply gamification principles to stimulate activities that involves creative and analytical thinking. (To know more about CRM gamification, click here). Take help of digital self service portals to automate monotonous tasks and generate unique cases that stretch your CSE abilities. Never forget to reward and recognize talented and deserving CSEs. More than monetary benefits, they crave appreciation for their hard work. Always remember, if you keep your CSEs happy, your customers will be delighted. A great CRM software can help executives create customized goals, daily tasks and milestones which are rewarded after completion. Drab user interface with difficult workflows, multiple screen hoping can make the work life of a customer service executive a living hell. Investing in a cloud CRM software can improve their work life with intuitive user interfaces, complete 360 customer profile view, drill down reports. Etc. Check out how CRMnext improved workforce productivity through CRM for a major banking institution. Your customer service executives work on the front-lines and are into the know-how of the latest customer trends and pain points. 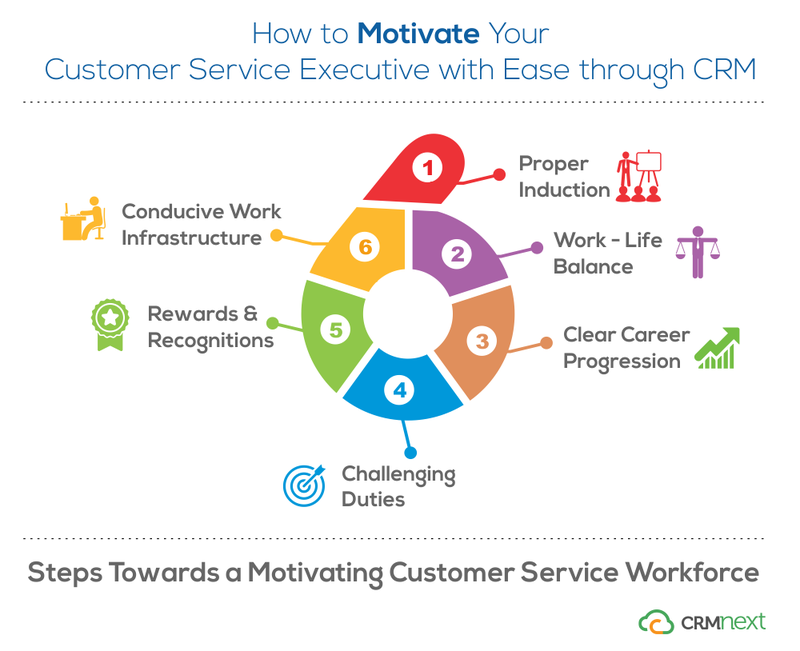 It is in your interest to keep them motivated through the best CRM solution. A customer service blog where brands find their recipe for delightful service!